Her first circumnavigation, with Alex Whitworth and Peter Crozier as crew, started with the 2004 Sydney- Hobart yacht race, continued from Hobart via Cape Horn and the UK and back to Sydney around the Cape of Good Hope in time for the 2005 Sydney-HobartSydney-Hobart Race: often described as the most gruelling ocean race in the world, this annual race starts on 26th December from Sydney Harbour and ends in Hobart. The course is 628 nautical miles. race. While in the UK she competed in the FastnetFastnet Race: 608 mile biennial race from Cowes, UK, Isle of Wight, to the Fastnet Rock off Southern Ireland, finishing in Plymouth. Berrimilla took part in 2005 and 2009. race and finished 11th overall out of 300 and second in the Double Handed division. As a result of this achievement, there is now a Berrimilla Dogbowl Trophy for the best double hander from Class 4 in the FastnetFastnet Race: 608 mile biennial race from Cowes, UK, Isle of Wight, to the Fastnet Rock off Southern Ireland, finishing in Plymouth. Berrimilla took part in 2005 and 2009. Race. During this circumnavigation, while crossing the Southern Ocean towards Cape Horn and later in the South Atlantic, Berrimilla’s nearest neighbours for a short time each day were the crew of the International Space Station, NASA Astronaut Dr.LeroyLeroy ChiaoLeroy Chiao: International Space Station Commander, Expedition 10, at time Berrimilla first made contact. Bio here. : International Space Station Commander, Expedition 10, at time Berrimilla first made contact. Bio here. Chiao and Russian Cosmonaut Colonel Salizhan Sharipov. The ISSInternational Space Station was in orbit about 300 km above and the two crews were in contact several times. They recognised the similarity of their situations. Berrimilla’s crew were subsequently invited to present their voyage to a symposium of astronauts at Louisiana State University as an analogue for a journey into deep space. At the symposium, Dr. Pascal Lee who runs the Houghton Mars Project camp on Devon Island in the Canadian Arctic, drew a map in Alex’ notebook and invited Berrimilla to rendezvous at BeecheyBeechey Island is an island located in the Canadian Arctic Archipelago of Nunavut, Canada. More on wikipedia Island (74.42N 091.46W) for the total solar eclipse on August 1st 2008. 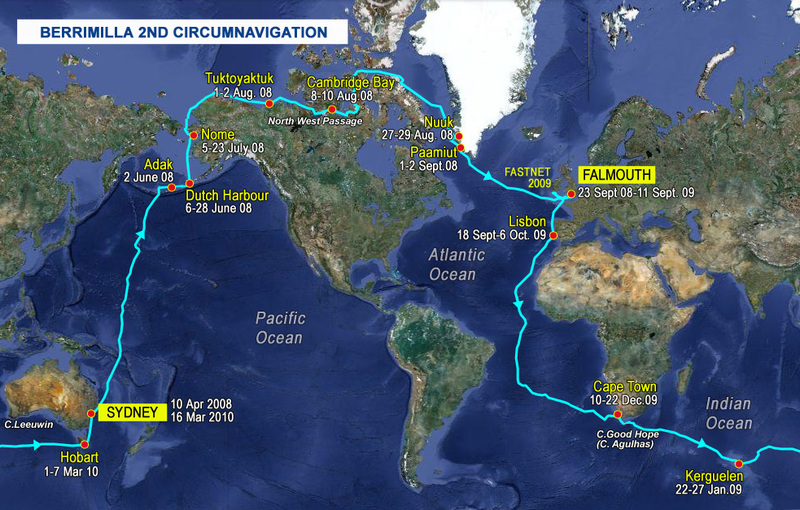 The second circumnavigation started on April 8th 2008 with Alex and Corrie McQueen as crew. Berrimilla sailed directly from Sydney to the Aleutians and then via the North West PassageThe Northwest Passage is a sea route through the Arctic Ocean, along the northern coast of North America via waterways amidst the Canadian Arctic Archipelago, connecting the Atlantic and Pacific Oceans. More here. 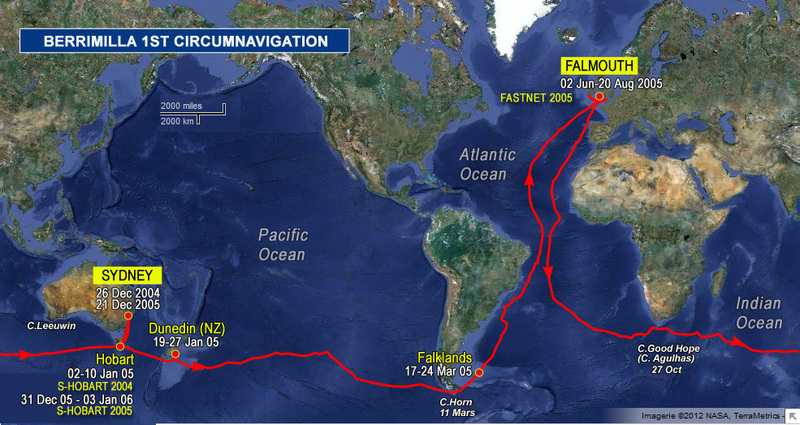 to Falmouth in England where she was laid up for the winter. En route, she sailed to within 40 miles of BeecheyBeechey Island is an island located in the Canadian Arctic Archipelago of Nunavut, Canada. More on wikipedia Island but called off the rendezvous because of dangerous ice conditions. The original intention was to return to Australia from the UK via the Northern Sea Route – the North East Passage north of Russia – but the permit to do so arrived too late for a safe transit before the 2009 winter freeze. Between circumnavigations, Berrimilla was rolled, severely damaged and dismasted south east of Gabo Island while returning from the 2006 Sydney – Hobart. Subsequent repairs took about 6 months. Sail from Australia to England via the North West PassageThe Northwest Passage is a sea route through the Arctic Ocean, along the northern coast of North America via waterways amidst the Canadian Arctic Archipelago, connecting the Atlantic and Pacific Oceans. More here. Circumnavigate the world under sail via the North West PassageThe Northwest Passage is a sea route through the Arctic Ocean, along the northern coast of North America via waterways amidst the Canadian Arctic Archipelago, connecting the Atlantic and Pacific Oceans. More here. Circumnavigate the world via both Cape Horn and the North West PassageThe Northwest Passage is a sea route through the Arctic Ocean, along the northern coast of North America via waterways amidst the Canadian Arctic Archipelago, connecting the Atlantic and Pacific Oceans. More here.. David Scott Cowper did it first, but in different boats. Berrimilla was the 77th vessel to transit the North West PassageThe Northwest Passage is a sea route through the Arctic Ocean, along the northern coast of North America via waterways amidst the Canadian Arctic Archipelago, connecting the Atlantic and Pacific Oceans. More here. since Amundsen’s Gjoa in 1903-6 and her transit was the 114th (some vessels have done more than one). No part of the Berri voyages was sponsored which is why everything was a bit primitive and low tech. And the inside of the boat was mouldy! I think that sponsorship largely destroys the integrity of the endeavour in the Corinthian sense. OK for the high achievers but not for us low key plodders. We do it ourselves with a bit of help from our friends. Pete did a lot of work on the boat in his own time and I did the other spending on things that we needed for the voyage – charts, food, spares, electronics etc. At a rough guess, each circumnavigation cost about $10,000 over the cost of the boat and its original equipment. We got discounts for food and whatever else we could manage and gratefully accepted donations via the website when things got tough. Shirts were made for us by Allan FenwickA friend and clearly a colourful character using IsabellaAlex's sister’s logo [link] and were sold via the website to help pay for a new liferaft and for radio repairs and satellite emails we sent when the radio died near the Azores. These voyages are extensively documented on this website and in a number of articles in sailing magazines and journals. Alex Whitworth and Peter Crozier have given numerous presentations to yacht clubs and other organisations on behalf of CanTeen, a charity for children living with cancer. On the way, Berrimilla and her crew received some interesting awards.